Roofs, as well as gutters, should be inspected by a licensed roofing contractor twice a year. We realize that to many homeowners, this seems like one time too many. But it’s important to make sure your roof is ready to handle fall leaves and summer heat before it’s too late. At Ridgeline Roofing, we take roofing systems seriously. And it’s our job to help Vancouver, Washington homeowners learn when to inspect and repair the systems that keep them safe and dry year round. Gutters have the dual function of keeping you dry as you come and go from the house, and your foundation as it supports the entire structure. If a concrete foundation is repeatedly exposed to moisture, it can become weakened; giving way to mold in crawlspaces and basements and eventually leading to some expensive repairs. We want you to avoid costly repairs by being proactive and starting at the top. The roof and gutter system work together to channel water away from the building’s foundation. But gutters that are clogged, leaky, or worn allow water to drain along the fascia, soffit, windows, siding, and eventually around the foundation. Gutters are aligned precisely along rooflines to guide drainage to downspouts. Misaligned gutters can cause rainwater, ice, and snowmelt to drain slowly or pool in the trays. When gutters are installed, they are placed at the bottom of sloped areas where water naturally flows. If gutters are placed too low, fascia can become worn and weakened quickly. 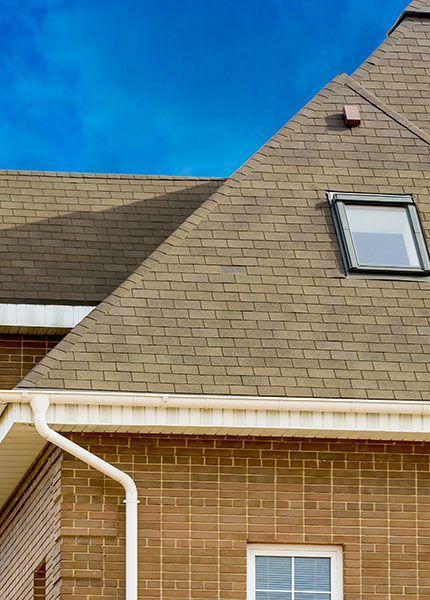 To prevent issues caused by incorrect installation, responsible homeowners hire an experienced roofing and gutter company like Ridgeline Roofing whose in-house crew is dedicated to a clear mission. Ours is to provide the best protection for your biggest investment without cutting corners. We accomplish this by using only materials that we can stand behind and by following a refined process that keeps our clients on budget and on schedule. Proper inspection of gutter systems requires climbing up on a tall ladder, so if you’re not comfortable with this, please give Ridgeline a call. We’re more than happy to perform a safe routine inspection at an affordable rate. Depending on our findings, we can then advise on whether your gutters need to be cleaned, repaired, or replaced altogether. Small Cracks – Big problems always start out as small problems. So during an inspection, we look for damage as well as the potential for damage. Loose or Sagging Areas – This one can be seen without even touching a ladder. Sagging or loose gutters can mean they are weighed down by a blockage, or that they’ve been damaged by falling debris. We’ll help you determine if the system needs to be replaced, or if we can repair just one section. Water Stains/Damage – If the fascia is stained, it’s likely that your gutters aren’t doing their job. Leaks and overflows cause damage to the soffit and fascia, so we’ll help determine how to reinforce the gutter themselves or recommend replacement. Peeling Paint – Rust or bubbling paint on gutters is a clear sign that your gutters have reached their breaking point. Replacement is the more practical option if the gutters themselves are beyond a certain age. Clogs – If your gutters aren’t directing water away from the house, or if water is spilling over and not being directed to the downspouts, you may just need a gutter cleaning. We can also talk about gutter guards to prevent leaves and debris from creating more clogs. Our customers rely on us for prompt, professional gutter service in Vancouver, Washington. Call today for gutters done right. Kept the rains at bay! We couldn’t even get in the front door when it was raining due to our clogged gutters. We had to run around to the side door. Thanks for the help.